Located in Koh Phangan, Awe Resort is a 3-minute drive from Ban Thai Beach and 6 minutes from Thongsala Walking Street. 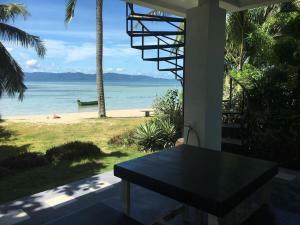 This beach villa is 4.8 mi (7.7 km) from Haad Rin Nai Beach and 7.5 mi (12 km) from Tharn Sadet Waterfall. Make yourself at home in one of the 4 air-conditioned rooms featuring kitchens with full-sized refrigerators/freezers and stovetops. Rooms have private balconies. Flat-screen televisions with cable programming provide entertainment, while complimentary wireless Internet access keeps you connected. Conveniences include safes and desks, and housekeeping is provided on a limited basis. Head down to the water and enjoy a day at the private beach, or take advantage of other recreational amenities, which include an outdoor pool. Additional amenities at this villa include complimentary wireless Internet access, tour/ticket assistance, and barbecue grills. When would you like to stay at Awe Resort ? Each day we'll check prices and send you an email for your selected dates at Awe Resort. If you don't have specific dates but would like to check prices for say next weekend or say next month we can check the price too. Click to write a review and share your experience of Awe Resort with other travellers.